Le Moulin de la Galette is also known as Bal du moulin de la Galette and is considered one of Renoir's most important works of the mid 1870s. This painting was first shown at the Impressionist exhibition of 1877 and demonstrated the original technique developed by Renoir. Today it is regarded as one of the greatest early paintings of the Impressionist movement. The Moulin de la Galette was an open-air dancehall and café that was popular among working class Parisians. On Sundays they would dress up and meet there to dance, drink, and eat galettes (pancakes). Several artists including Renoir would assemble there to enjoy the festivities, draw inspiration, and often to find unprofessional models to include in their works. Le Moulin de la Galette depicts a typical Sunday afternoon in the courtyard, with attendees enjoying the open-air dancing and ambience. This popular Parisian hangout was situated in the district of Montmartre, close to where Renoir lived. This cafe provided the perfect scene for the artist; smiling, attractive couples dancing without a care in the world. Known for his pleasant paintings, Le Moulin de la Galette is considered one of the happiest compositions in Renoir's oeuvre. 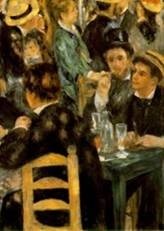 Renoir painted The Moulin de la Galette at the dance itself and did not prepare any sketches beforehand. Renoir's brother claimed that he researched this piece for six months and it's believed that his friends helped him to carry the huge canvas to the café and posed for him. Most of the figures featured in Le Moulin de la Galette were Renoir's friends, but he also used several professional models. Thus, it can be said that the scene he depicts is not a realistic representation of the Moulin's clientele, but rather an ordered set of portraits. The girl in the striped dress in the centre of the canvas is believed to be Estelle, the sister of Renoir's model, Jeanne. Another model, Margot, can be seen on the left, dancing with the Cuban painter, Cardenas. Gathered around the central table are Renoir's friends, Frank Lamy, Norbert Goeneutte, and Georges Rivière. Rivière, a writer who knew Renoir well at this time, wrote a review of Le Moulin de la Galette in the journal L'Iimpressionniste which accompanied the exhibition. The writer referred to Le Moulin de la Galette as a "page of history, a precious and strictly accurate portrayal of Parisian life. " Yet, others were not so kind and many contemporary critics regarded this canvas as merely a blurred impression of the scene. Although Renoir painted some of his friends in the canvas, his goal was to express the lively and carefree atmosphere of this popular dancehall. It seems he wanted to depict the true feeling of the dance: the couples, their poses, and their expressions. This scene suited Renoir perfectly. He enjoyed painting pleasant scenes and happy people, and summery, open-air settings such as this were one of his fortes. This canvas was one of 21 works shown by Renoir at the third Impressionist exhibition in 1877. Renoir painted two other versions of Le Moulin de la Galette; a small sketch now in the Ordrupgard Museum, near Copenhagen, and a painting smaller than the Louvre version in the John Hay Whitney collection. Today, Le Moulin de la Galette is kept at the Musee d'Orsay in Paris and is one the most celebrated works in the history of Impressionism.